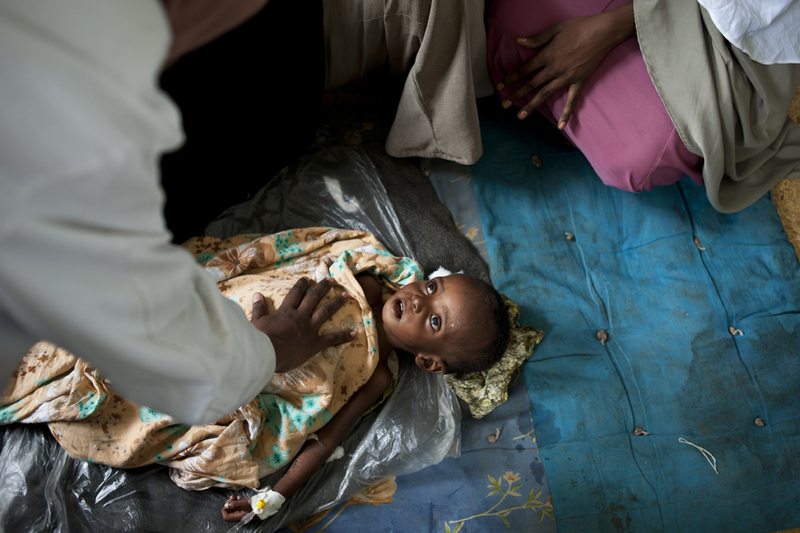 A Somali doctor checks for a heartbeat as Abbas Nishe, 1.5 years, struggles to fight severe malnutrition in the Benadir Hospital in Mogadishu, Somalia, August 25, 2011. The hospital is overflowing with people sleeping on the floors throughout most wards. Thousands of Somalis have traveled to neighboring countries and to the capital city of Mogadishu to escape extreme drought conditions in their villages--an estimated 1.7 million people have become drought displaced, according to an UNOCHA report. The horn of Africa is suffering one of the worst droughts in years, displacing thousands, and killing others through severe malnutrition, measles, and diarrhea.